I didn't grow up eating super healthy. Don't get me wrong, my parents fed us well, cooked us balanced dinners, and we were certainly never hungry -- but they came from the school of, "eat what you want when you're old enough to make the choice." And what do kids and teenagers want? Or at least what did I want as a kid and teenager? Cinnamon toast crunch or mini muffins (chocolate chip, of course) for breakfast, Little Debbie everything for snacks (my favorites were the honey buns, oatmeal cream pies, and nutty bars... every day... seriously), sandwiches and chips for lunch (plus some fries from the cafeteria... dipped in mayo), burger king chicken tenders when I had some cash, oreos dipped in peanut butter for dessert... yeah. For real. Fortunately, I also liked fruit and veggies to balance it out, but I basically ate whatever sounded delicious. I was a naturally skinny kid with a lightning fast metabolism, so I ate this way without gaining an ounce. My parents both cooked, but they weren't health freaks by any stretch of the imagination. Dinners were spaghetti, macaroni and cheese, cheeseburgers, steak and potatoes, tacos. And I loved it! I don't think there's anything wrong with the way I grew up eating, per se. 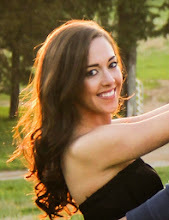 I was a happy, healthy kid who played lots of sports and ran around outside rather than watching TV after school; I never over-thought food and what it meant; I had a healthy, positive body image that I learned from my mom; I was never told I couldn't eat something because it was "fattening".... and I turned out just fine, if I do say so myself. I simply learned to make my own food choices; and while it took me a while (around college time) to actually start making primarily healthy choices, I got there eventually. I know lots of parents today are more mindful of what they feed their children -- and there's certainly nothing wrong with that -- but I think there's something to be said for just... not making food a huge deal for kids. I'm sharing an adaptation of one of my favorite recipes of my mom's today. A healthier version, but still delicious. My mom still isn't a health freak. She's fit and thin -- she plays tennis nearly every day, walks 5 miles most days, and looks (and feels) awesome. But she falls more into the "eat what you want in moderation" category -- chips, white bread, half and half in her coffee every morning -- and I've certainly never seen her go near kale or quinoa or a green smoothie, that's for sure. This works for her and she's a *pro* at moderation (which I can't always say for myself). She has some super delicious recipes, too! I remember eating her chicken sandwiches with lime mayo growing up and *loving* them. For hers, she'd rub fajita seasoning on the chicken and cook it in oil, then serve it on white buns with a lime mayonnaise. Delicious! While there's nothing wrong with her sandwiches... when I got a craving for them, I decided to make them a littttle bit healthier. Marinating the chicken and grilling it, serving it on an open-faced sandwich, and making the lime "mayo" with avocado and greek yogurt, to be specific. While I don't see my mom switching recipes any time soon, I think you all will love it. This creamy lime sauce is AWESOME! The chicken is marinated overnight then thrown on the grill. So juicy and flavorful. I also grilled up some summer veggies -- yum. The lime sauce is the perfect tangy accompaniment to the chicken. I couldn't get enough -- and neither could Ryan! He actually thought there had to be mayonnaise in it, it's so creamy. That's the beauty of avocados! The night before, put 4-6 chicken breasts in a ziploc baggie with the following marinade ingredients: 1/2 cup EVOO, 1/4 cup honey, 1/4 cup rice vinegar, 4-5 cloves of minced garlic, the juice of 1 lime, and some salt, pepper, and basil. When ready to cook, fire up the grill. You could also do these on a grill pan or skillet. Cook over medium to medium-high heat for about 6 or 7 minutes per side, or until cooked through. Meanwhile, prepare your sauce. 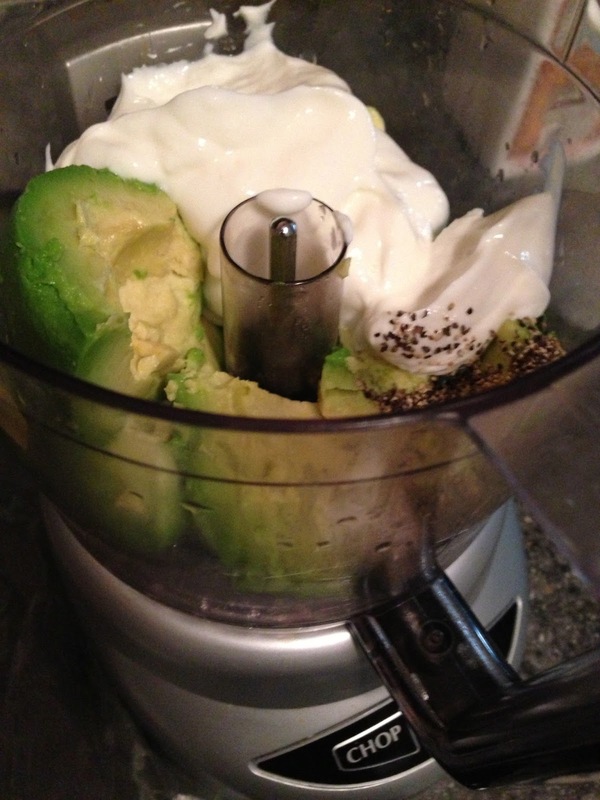 In a food processor, combine 1 ripe avocado, 1/2 cup plain greek yogurt, 1/4 cup milk, the juice AND zest from 1 lime (the zest is key for that super lime-y flavor), and salt and pepper. When the chicken is ready, take it off the grill and tent with foil. If you want to grill some veggies too, just toss them in olive oil and season with sea salt, pepper, and whatever other spices sound good, thread onto skewers, and grill while the chicken cooks. Prepare your sandwiches: top a whole wheat bun with spinach, a chicken breast (slice in half if you'd like), and the lime sauce. Sooo good. Ya gotta try this one, y'all. -6-12 hours before (or the night before), mix together your marinade ingredients in a bowl: 1/2 cup olive oil, 1/4 cup honey, 1/4 cup vinegar, garlic, the juice of 1 lime, basil, and about a tsp each of salt and pepper. Place the chicken in a ziploc bag and pour the marinade in. Place in the fridge until ready to cook. -For avocado lime cream sauce: in a food processor, combine the avocado, yogurt, milk, and the juice AND zest from 1 lime. Pulse until smooth. For a thinner consistency, add more milk. Add salt and pepper to taste. -To grill the chicken: on an outdoor grill or grill pan, cook over medium to medium-high heat for approximately 6 or 7 minutes per side, or until cooked through. Remove from grill and tent with foil until ready to serve. -For serving, place 1 chicken breast (or cut in half) onto a whole wheat bun with spinach or lettuce. Top with a big dollop of the avocado lime sauce. This sounds so amazing! I'm trying to start a healthier life style and recipes like this will surly help me on my journey. I'm so excited to try it!